This is a small portion of 10,000 acres of public land, which gets very little bow pressure. Big timber & hardwoods. Just found out about it today, I will scout it all day on Labor Day. Just curious what you think about it. I see a couple of promising spots, let us know how it goes once you put boots to the ground. Where did you find a map like that? That's what I would like to have for a couple of the places I want to hunt. 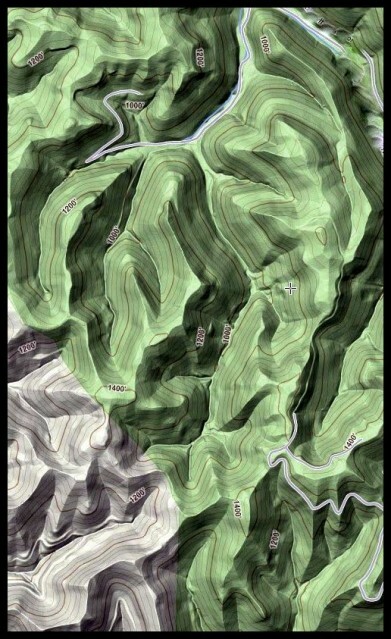 I can make that out a lot better than a regular topo. Those lines mess me up. Never was good with em. That is the "terrain" view at this link. It has several useful viewing options. Watch these vids, it will help you to understand contour lines. Dave, does look good, see some interesting scout spots. Are we looking at it w/N up? It's deceiving since the shaded[shadows] indicate the sun is coming from the west? This area, displayed above, is not something I'm going to invest any time in presently. I have too many good spots, & keep finding more at my main public land wma. Ragepassthru wrote: Where did you find a map like that? That's what I would like to have for a couple of the places I want to hunt. I can make that out a lot better than a regular topo. Those lines mess me up. Never was good with em. If you still need some help let me know. We do a variation of that style for our public land topos and it seems to help a lot of people read the topography a lot better.